In the Rider Measurements page we discussed the critical dimensions of the rider, here we cover the variety of seats and how to best fit the rider. In the Seat Padding page we showed you how to tailor fit a Hardshell Seat to the rider with foam padding. Trike Seats come in different sizes & configurations depending on the model. 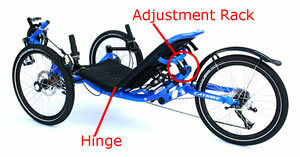 Some like the Catrike models are actually integrated into the frame design while other models host a removable seat. Some seats are fixed where others are adjustable. Seats may be constructed of a tube frame seat frame with mesh material strapped to the seat frame or they may be a fiber reinforced composite (fiberglass or carbon fiber) Hardshell type. Other materials including plywood and aluminum sheet metal have been used on Trike Seats. Mesh Seats are the most forgiving as they do a great job conforming to a rider's body and breathe the best. Typically Mesh seats come only in one size although a few OEM's are beginning to offer XL versions for wider hipped riders. The added compliance of a Mesh Seat may not work for everyone. It is the rider's option to add padding for custom support. Seat Mesh is tightened or loosened with straps across the backside of the mesh material. Some have buckle systems some use thin ropes. Seat back contour is part of the frame structure. Some seats are simply flat, others may have a lumbar support. Seat Back contours can be altered by fitting padding. Testing the position of padding is often done with double sided tape to find the right position and changing the shape of the pad to conform to the rider's needs. Be patient with finding the right alterations with padding; it may take a dozen or more rides to find the perfect solution. Mesh Seats are most popular among Trikers as they add a tiny bit of isolation from road shock and breath really well. They take the least amount of padding-tweaks to fit the rider the best. Most Mesh Seats also have pockets sewn in to carry items like cell phones, wallets, batteries, tools and other items you may want to always keep with you. 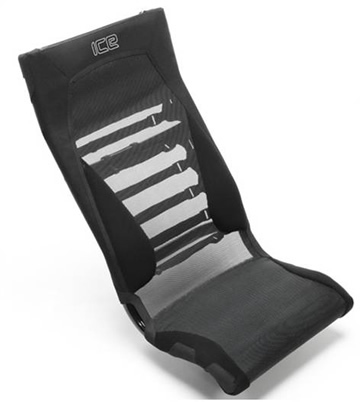 Some Mesh Seats are adjustable depending on the manufacturer and seat mounting. Fixed seats may have adjustable seat backs and mounted seats may adjust vertically, horizontally, and tilt angle. Bucket Seats allow swapping between a Mesh or Hardshell. As the Integrated seats are not adjustable the only option to fit the seat is by padding. Some riders learned after buying their trike that the seat angle was too reclined for their comfort and resorted to propping their backs up with the use of a special back pillow. The most common instance of this is on the Catrike Expedition using Lumbar Contour cushion from Relax-the-Back mounted upside down - the thick hump end is at shoulder level. When using that option, the lumbar isn't supported very well so its recommended to also add the Self Inflating Back Rest. In some cases on a Catrike 700 riders have fabricated adapter mounts for the Catrike 700 to install a Hardshell Seat that has less recline. Typically this turns into a $500 modification so bear that in mind if you're not sure that the recline angle is right for you. 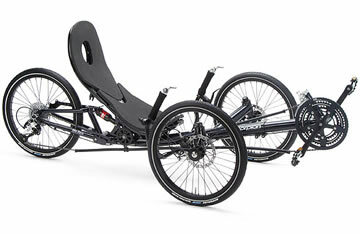 Catrike patented the design of an Integrated Seat as a lightweight and strong structure, however a buyer is strongly encouraged to test ride any trike to be sure they will feel comfortable given the range of adjustment options offered. Hinged Back seats are found on some later Catrike models like the Villager, Trail, Road along with the HPV Gekko FX. Most Hinged Back seats have no "lumbar bump" with straight rails. As the seat pan is fixed the seat angle does not change with the recline angle. This is probably the easiest design to accommodate a rider particularly when augmented with a Self Inflating Back Rest for lumbar support. Bucket seats have 2 or 3 mounting points with the bottom point being the swivel axis of adjustment. As the seat back is reclined, so is the seat pan. Conversely when the seat is set more upright the seat pan also levels out which tends to allow the rider to slide forward a bit. 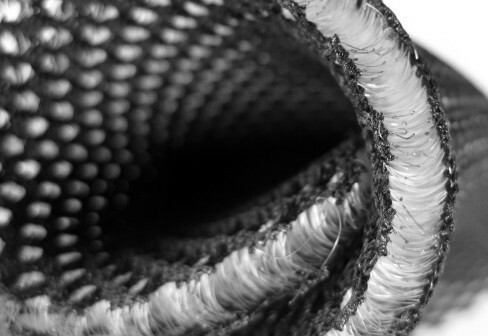 Tubular Padding such as dense pipe insulation or swimming pool noodles are often used to add padding to the frame of a Mesh Seat. Its especially helpful to pad the Seat Rails if they come in contact with the rider's body. The Seat Mesh fabric must be removed to install tubular padding on the Seat Rails. Tubular Padding will need to be sized such that the inner diameter is close to the diameter of the Seat Rail tubing. Swimming pool noodles will need to be slit along the axis to allow fitting on the rails. They may be wrapped with some electrical tape if needed. 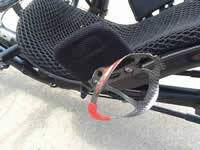 Most seat straps can be adjusted far enough out to accommodate 1" wall thickness of Tubular Padding. For shorter riders adding Tubular Padding to just the Seat Pan region can position the Lumbar hump in the Seat Rail at a lower position that may make the seat much more comfortable on longer rides. Tubular Padding also helps cushion the ride a little however adds a very small tradeoff in climbing steep hills. One drawback with Tubular Padding is its not permanent; after 500-1000 miles it will crush and will need replacement. Typically that's not too inconvenient as most Mesh Seat Straps needs to be tightened about every 100 miles or so, and after a few times of most owners can remove & replace the Mesh in just a few minutes. Hardshell Seats provide a rigid base of support and almost always have compliant padding added. Typically they come in large & small sizes. The HPV seat shown has a unique adjustable back length that fits shorter and taller riders rather well. Most Hardshell Seats tend to have narrow seat pans which work well on a two wheeler but may not be Trike optimal. As the Hardshell is a rigid backing it will be more difficult to fit any particular rider then a Mesh Seat, however once a seat is correctly fitted, few hardshell riders want to go back to a Mesh Seat. Custom fitting padding is easier and typically once a rider has custom fitted padding they are more comfortable then a Mesh Seat. There are breathable padding materials that rival the breathability of a Mesh Seat, see Padding below. Hardshells tend to help riders climb steep grades due to the lack of seat flex. They do not have pockets so items will need to be stored in a separate bag. Hardshell Seats may be made of fiberglass, carbon fiber, wood, molded plastic, even formed aluminum. While carbon fiber offers the lowest weight (about 25 ounces) fiberglass is generally only about 6-8 ounces heavier, often at half the price. Adding about 1 Lb of padding, a typical Hardshell seat is still roughly 2 lbs lighter then most Mesh Seats. Seats made from plywood are generally under 3 lbs in weight and for those with wood crafting skills there are fabrication guides on the web. As seats are mounted to the frame, mounting provisions are often the most overlooked items. Not all Hardshell seats will fit on the same mounts for the same trike. As Hardshell seats are compound curve shapes with reinforcing ribs it may take some bracket/mount engineering & fabrication to retrofit an alternate seat. Moreover if a flat bracket area is attached to a curved section of seat it will almost certainly begin cracking the seat without a flat surface fiberglassed on to distribute the load. As the seat is angled more upright, hardshell seats tend to require a thicker and wider seat pan to maintain comfort on longer rides for most people. A general rule of "rump" is the width of the seat pan should be at least 75% of Thigh Width (see Rider Specs). However as the seat angle begins to approach 40° you may want to add an inch and up to 2" at 50°. Reason being that the less reclined the seat is, the more weight is concentrated on your rump. Hardshell seats don't breathe very well without a layer of breathable material above composite shell. One of the most breathable materials is a Polyester Warp Knit fabric also know as 3D Spacer Mesh. This fabric has a network of polyester threads woven between two mesh layers in a way that acts like a cushion between the outer layers. Ventisit is one commercially available Spacer Mesh Seat Pad and generally retails for about $100 with custom sized pads made just for your seat. Alternately there are a few sources for the raw materials that don't require importing such as 1/2" Drymesh Mattress Padding. About 1" thick 3D spacer fabric will provide excellent ventilation and good seat compliance. Filter Foam (30 Pores/Inch) is a budget breathable foam that's often used although has a scratchy feeling against bare skin. Closed cell foams are best used under a breathable layer to provide a custom tailored support. 1/2" Camping Mat from Walmart can be cut into 1-2" wide strips and stuck down to the seat with a low adhesion double sided tape for custom fitting purposes. Strips are recommended as they are easiest to conform to the compound curves and placement isn't limited to one direction. For example, you can build a row of diagonal strips that meet in the center in a chevron ^ pattern, or place them vertically or horizontally. You can build them up more then one layer in low support areas such as lumbar region. After placing the padding strips, install the breathable pad and see how it feels. Its not usual to make a dozen little changes over 200-500 miles of riding to find the perfect fit. Some Hardshell seats can be fitted with wings that angle up alongside the kidneys. Wings add some support for riders who lean a little but also restrict how far a rider can lean. If you make hard turns and like to "lay over" to the inside you won't like the wings. Also shown on this seat is a Ventisit pad and a water bottle mount. Hardshell Seats have holes where the seat mounts attach that can also be used to mount brackets to attach things like water bottle mounts and phone mounts. Short Rider Stature applies to riders under about 5'5" in height; this is more of a generalization as no two people may be proportionately the same but you get the idea. Trike designers tend to optimize a design to fit a range of adults between the average size of a man/woman allowing some compromise in comfort for those falling outside that range. That puts most trikes as optimally fitting those between about 5'5" to 6'1". Accommodations to fit taller riders are a little easier then to fit shorter riders. Shorter riders can still be fitted on most trikes down to about 5'1" when attention is paid to the critical points that need alteration. X-Seam around 40" or less may favor moving the seat forward and cutting the boom 2-3" to shorten it. Not all seats can be moved forward with stock mounts. Up to 1" of back padding may help move the rider forward. Seat Recline Angle on models with removable seat frames the entire seat will lean forward or back hinged on the bottom seat mount. As the seat back is angled up the seat pan is also angled up. Most riders need about 5° tilt in the set pan to avoid sliding forward as they ride. While you would think the pedal pressure should push you back, part of what's happening as you flex your gluteus muscles they literally walk you forward slightly in the seat. Seat Pan Angle may be fixed on seats with adjustable Mesh Seat Backs, or will change with Seat Recline Angle on removable Mesh or Hardshell seats. When the Seat Pan is parallel to the ground the rider will tend to slide forward as they pedal; while this may seem counter-intuitive as the rider is pushing back on pedal strokes, as explained above the gluteus muscles tend to "walk" the rider forward. On removable seat models with the Seat reclined at either extreme the front of the Seat Pan may either be too high or too low. Too high is when the back of the legs have excess pressure resulting in a numbness that begins just above the knee. Too low is when the rider slides forward. A wedge shaped pad like this one from the Hostel Shoppe can correct Seat Pan Angle problems. Seat Pan Width is generally sized for those with a belt size up to 46". If you're larger then that you may want to consider an XL seat. Back Height is generally sized for someone between 64" to 75" tall. Torso lengths may vary but for the average person the stock seats are usually in that height range. Ride Height can affect the ease in which the rider mounts on the seat. Tadpole Sport Trikes may have seats as low as 6" while Delta Trikes may be as tall as 18". Some seats have Ride Height Adjustment built in. Padding can be used to tweak regions of limited support, raise a seat as much as 1 inch and move a rider forward 1". Neckrests prop the neck with increasing support as the angle of the seat is more reclined. Most are adjustable in fore/aft up/down positions.